“It’s not nice to fool with Mother Nature … it can be HORRIFYING! EVEN TO THEM!” Also known as The Freakmaker, this entertaining, low-budget British horror film was directed by Jack Cardiff and features some truly campy special effects in the story of a rather demented college instructor/biologist, “Professor Noller” (Donald Pleasence), who has been experimenting on ways to genetically mix the DNA of plants and animals. Noller’s horribly disfigured sidekick, “Lynch” (Tom Baker), provides the subjects (most of whom are culled from Noller’s own classes for some inexplicable reason) for his disturbing experiments. The resulting mutations are eventually turned over to a local circus sideshow for display when the good doctor gets through with them. 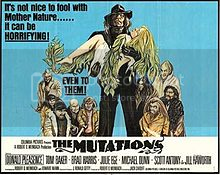 The Mutations was obviously heavily influenced by Tod Browning’s 1932 classic Freaks. In fact, one of the highlights (in fact it may be the only highlight!) of the film is the depiction of the creepy “Ten-in-One” freak show that features the likes of “Popeye” (Willie Ingram), “Monkey Woman” (Madge Garnett), “Pretzel Boy” (Hugh Baily) and “Frog Boy” (Felix Duarte), among others. Vincent Price was reportedly the original choice for the role of Professor Nolter. Useless Trivia: Baker is best known for his portrayal of the Doctor in the TV series Doctor Who (1974-81).